Traditionally health care research is often valued on the evidence-based basis, which is dominated by statistically motivated quantitative research. However, the increasingly popular use of qualitative methods in general and health research, in particular, has provided a different kind of research evidence, which reflects real-life issues in social contexts. 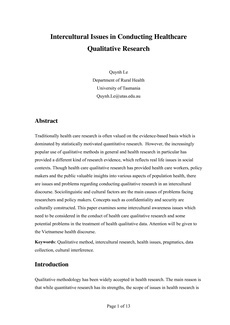 Though health care qualitative research has provided health care workers, policymakers and the public valuable insights into various aspects of population health, there are issues and problems regarding conducting qualitative research in an intercultural discourse. Sociolinguistic and cultural factors are the main causes of problems facing researchers and policymakers. Concepts such as confidentiality and security are culturally constructed. This paper examines some intercultural awareness issues that need to be considered in the conduct of health care qualitative research and some potential problems in the treatment of health qualitative data. Attention will be given to the Vietnamese health discourse. Qualitative method, intercultural research, health issues, pragmatics, data collection, cultural interference.